Originally commissioned by Nicholas Hytner for the National Theatre as a Christmas entertainment, this version proved so popular it was revived again and again. This is a perfectly faithful adaptation which remains true to the spirit of the joy of the riverbank without being quite so gentle. The lyricism remains through the music and all the characters, Mole, Rat, Badger and the irrepressible Toad, to say nothing of the wicked Weasel, are here in all their glory. This will be a treat for all the family and a tremendous end to our 2005 season. 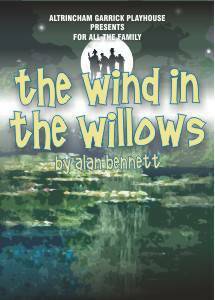 Please note, to coincide with the half-term holidays a matinee will take place on Saturday 4th June 2005 at 2.30 pm. As we expect all performances to be fully booked please book early, especially for the matinee.